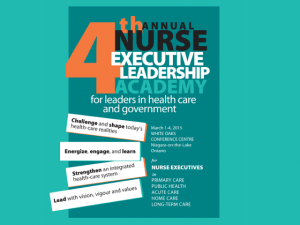 The 4th Annual Nurse Executive Leadership Academy is a 3.5-day course designed for Nurse Executives in Primary Care, Public Health, Acute Care, Home Care, and Long-Term Care. Building on themes of system transformation, values based leadership, evidence and balance, the 4th Annual Nurse Executive Leadership Academy offers an inspiring leadership knowledge festival for nurse executives from ALL sectors, including public health, primary care, hospitals, home care and long-term care. The program will feature leadership gurus, experts from government, policy makers, and other leading edge thinkers, to channel new energies to address common and unique challenges reinforcing enduring values, the role of evidence and the need for balance. Attendees will come away with novel insights and scientific and experiential knowledge to enact governance, leadership and practice roles based on a comprehensive system perspective. Participants will have the opportunity to share specific issues, dialogue across sectors, hear multiple points of view, and engage in dynamic discourse.